Radio 1's Big Weekend 2017 will take place in Hull, with Little Mix and Kings of Leon already confirmed. The event will be held on the Bank Holiday weekend of May 27th and 28th at Burton Constable Hall, with grime artist Stormzy also confirmed. The news is another boost for the East Yorkshire city as it begins its year as UK City of Culture. Thousands are expected to attend. 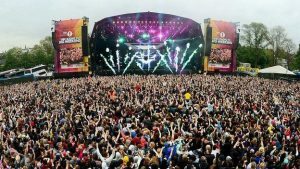 Leader of Hull City Council, Stephen Brady said: "Radio 1's Big Weekend is a major highlight in the UK festival calendar and to have it coming to our region is really a testament to the fantastic work done by the 2017 team, Hull City Council and our partners in the East Riding." Now in its 14th year, past Big Weekends have taken place in Exeter, Norwich and Derry/Londonderry and have included appearances from the likes of Coldplay, Muse, Foo Fighters and Taylor Swift. Martin Green, director of Hull UK City of Culture 2017, said: "Bringing this major national event with some of the biggest names in the music industry is a massive coup for the city and confirms its growing international profile as the place to be."